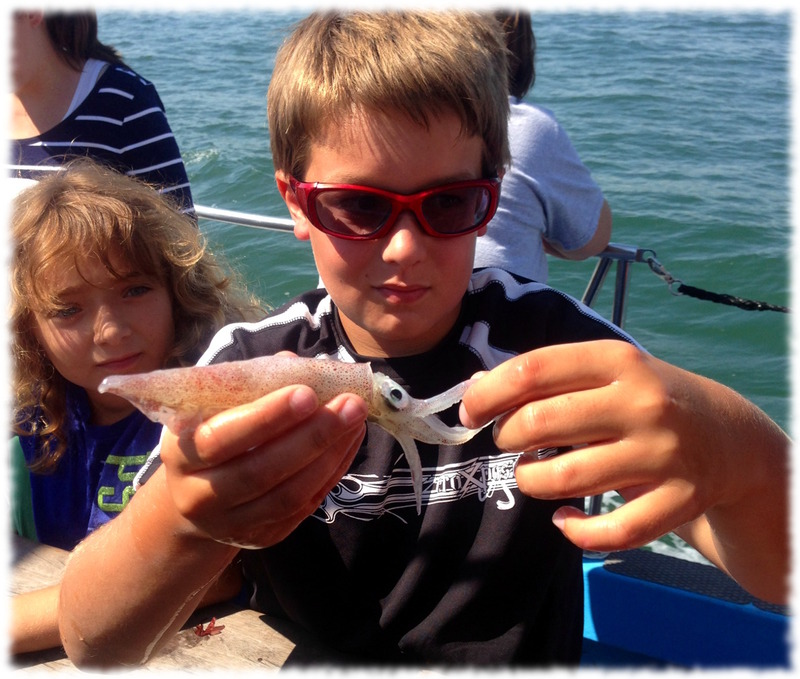 Will has been attending Project Oceanology Ocean Explorer camp this week. 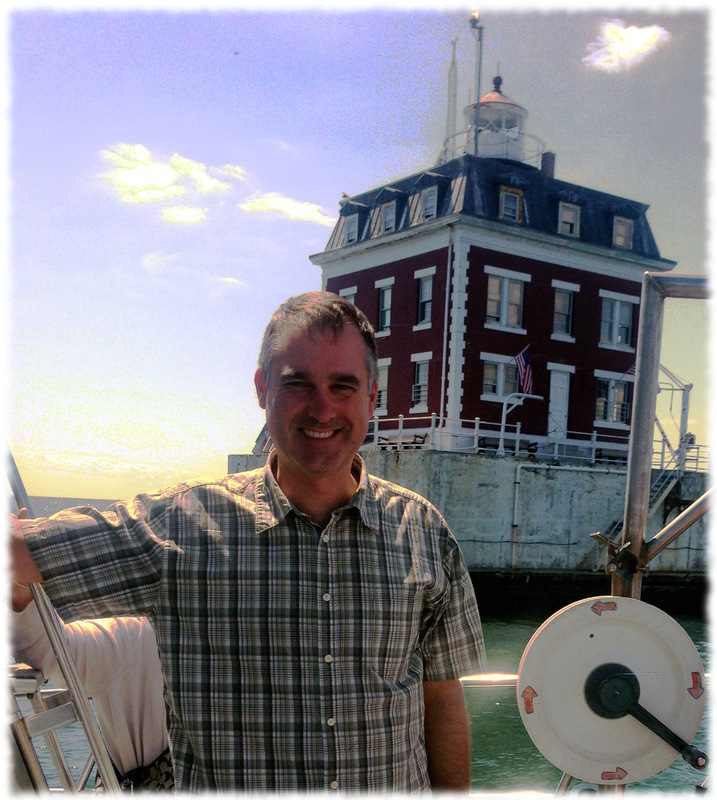 Today, Susanna and I got a chance to head out on the boat with his class and see what the camp is all about. Here are some pictures from today. I should be getting more pictures from the camp in the mail over the next couple of weeks and I’ll try to post them when I get them. 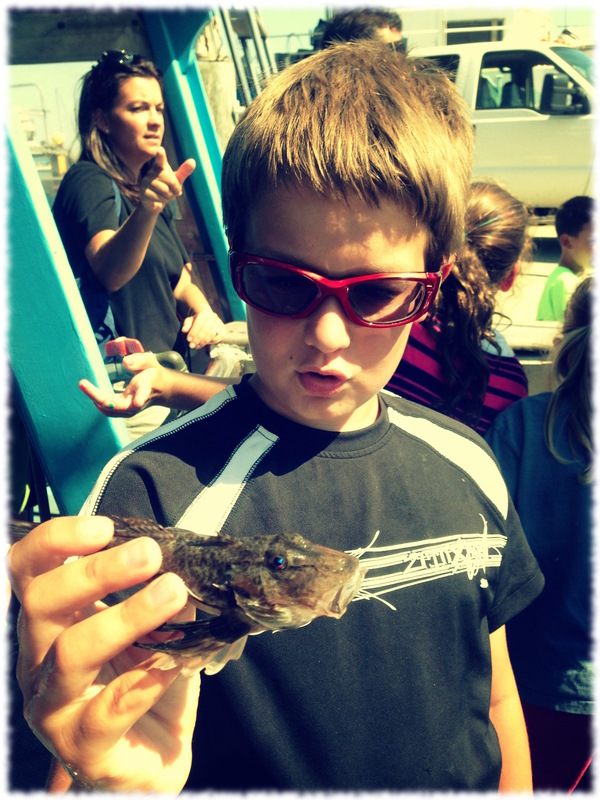 We all got to pick up and inspect the creatures picked up when trawling around Ledge Light. Passing close to New London Ledge Light. The view of New London Ledge Light. Will showing off a small sea robin. Will showing off one of the squids found while trawling in Long Island Sound with Project Oceanology. It is Monday. That means going to work this morning. Although, these days, it might mean staying home on furlough. I’m doing a mix. I’ll take a couple of hours of furlough today and go into work late. 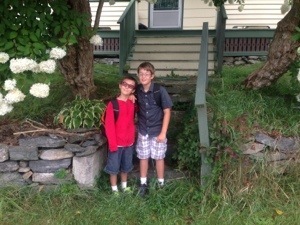 The boys arrive today for the week and both boys have summer camp. Ben is going to basketball camp in Preston. 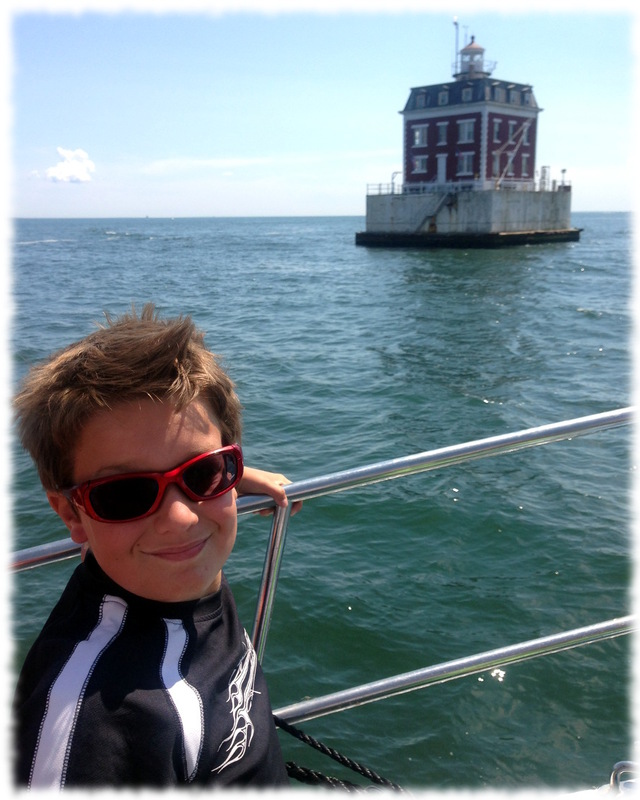 Will is going to Project Oceanology camp in Groton. This morning there is orientation for parents at Will’s camp. Susanna and I will be heading to Groton with Will, and I’ll head into work after orientation. 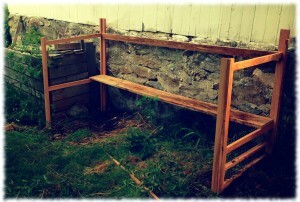 The first stages of building the chicken coop. I’m not sure this is the right way to go about it, but it seems to be working so far. I checked on the chicken coop this morning. No progress was made last night while I was asleep. Oh well. I guess that the fairies and elves that wander the woods behind the house were busy with other projects last night. Or maybe they saw the quality of the construction of the carcase and decided to take no part in the construction. Or maybe they just don’t like chickens. The posts on the coop are made from red oak. The oak is milled to about 1″ thick. I take two 2″ wide sections and glued and screwed them at a right angle to make a L-shaped column. They are connected with oak stretchers. 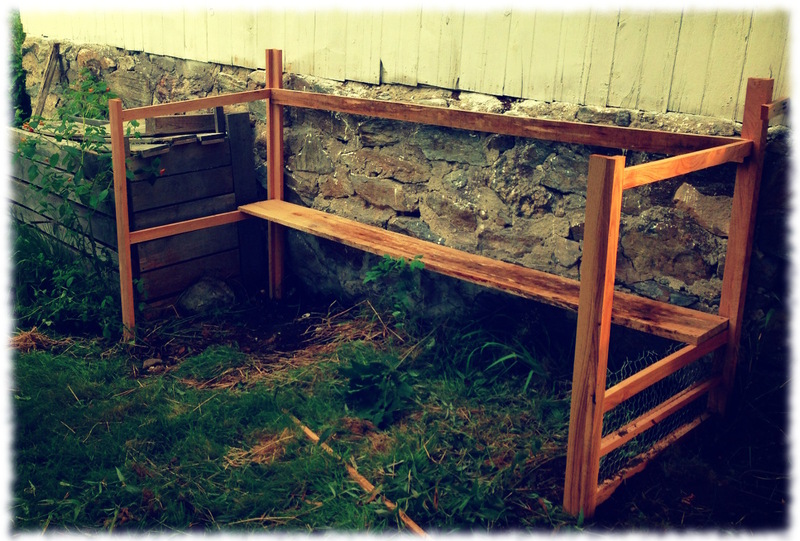 I’ll add the chicken wire around the base next, and then build the floor and ramp for the chickens. The walls and then a hinged roof will follow. To the left of the coop will be a run and new compost bins. The oak is pretty wet, so I won’t paint it until later in the year. Susanna and I had a weekend without the boys. This was the first time in a while we have had a full weekend without the boys and without Susanna working. It was a nice change. We didn’t take full advantage of a free weekend and get away – but one of these weekends we will. We also didn’t just sit around and do house projects all weekend either. Friday night saw us heading out for an evening with some friends. It is nice to catch up with old friends. However, I’m pretty sure I tell the same stories over and over. I’ll have to either have some more exciting trips with work (or with Susanna), or start being better at writing fiction. I guess I could stop telling old stories and listen to people. But that isn’t going to happen. Saturday we didn’t have the most productive morning. But unproductive mornings are important. It is too tiring to have to be productive all the time. 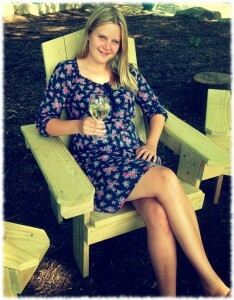 We did escape in the afternoon to a local vineyard for a wine tasting. We even had a nice discussion over a glass of wine on why we shouldn’t get a bigger sailboat. I’ll have to keep working on that one. Today was a chore day. I know, “chore day’ sounds terrible. But it is nice to have no major projects to work on. 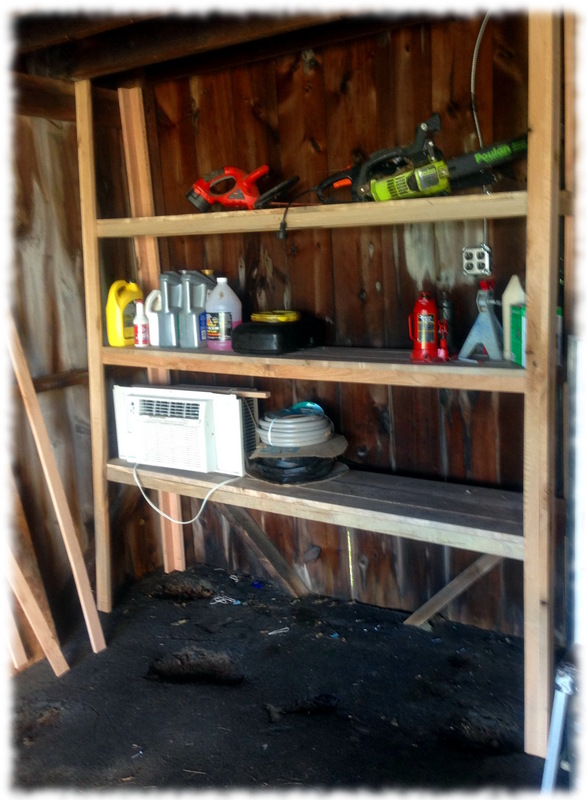 I mowed the yard in the morning, and when I got bored with mowing I wandered into the workshop to finish building shelves (yes, my ADHD approach to chores – mostly finish one and move on to another one). But eventually I did finish mowing the yard. I also finished the storage shelves in the garage somewhere in the middle of mowing the yard. There is nothing like having a ton or two of rough maple and oak to use to build utility shelving. The shelves start wide at the bottom and get narrower at the top. The slope was actually a planned feature, not just shoddy construction. These shelves are much narrower than the previous plywood and 2×4 shelving we had there before the wedding. Having shelves much deeper than 15-18” make it difficult to keep things organized. It is too easy to hide things in the back of the shelves. Garage shelves made from maple and red oak. We are looking to get 4 hens in the next couple of weeks (as soon as I have a coop and run built). The coop and run will be next to the garage and will replace the current compost bins. Construction pictures will follow as I get farther along in the project. 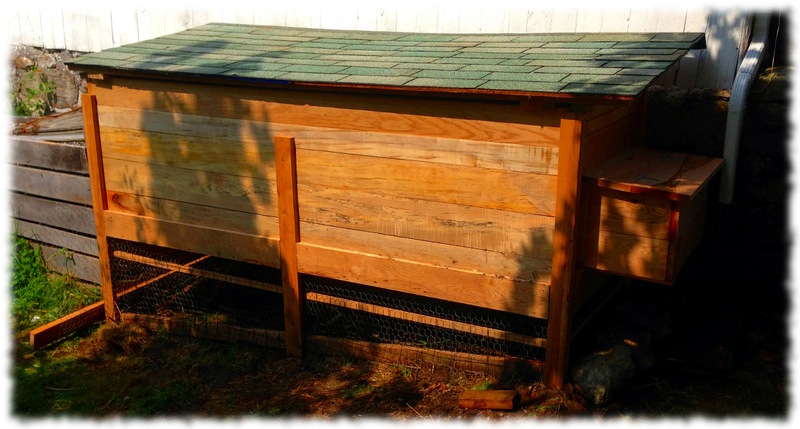 So, for those asking, yes, I did finish enough of my other projects to start building the coop. We might even get the hens before they die of old age. And in other good news, last week our furlough was reduced from 11 days to 6 days. This week will be my final week with a day of furlough. This afternoon I took the boys out sailing for the last time this summer. We only paid for two months at the submarine base marina. With the summer coming to an end in addition to being on furlough, we decided to not extend the time at the base. Susanna and I should get a sail or two in before we have to take the boat out of the water, but I don’t think there will be time for the boys to go sailing until next spring. 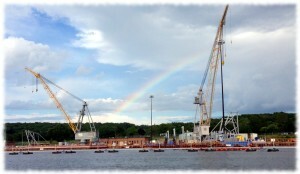 Today we motored south of the base and put up the main north of the bridges. A gentle breeze pushed us downriver. Before we passed under the bridges, the boys and I hanked on the jib. As we went south the breeze picked up. In New London harbor, the gusts would push us over at least 20-degrees, but the wind wasn’t constant. It would pick up and die down. It couldn’t pick a direction either. The gusts and waves made Ben a bit nervous, so we eventually dropped the jib. We ran to pine island and turned around just short of the harbor entrance. Once we turned back into the river we beat into the wind upriver for a bit, finally grew bored, and started the outboard. I think our timing was pretty good. A storm passed south of us as we drove up towards the base – we only caught a little of the rain. The bridges disappeared in the haze of the storm almost entirely as we motored past the base. We reached our slip in sunlight as the storm headed east. What Tucker thinks of the crazy summer…. I spent some time last night looking back at my old blog posts. Reviewing posts from 2 and 3 years ago. What a fright. I hate reading my own words. In addition to the obvious fact that I frequently don’t proofread my posts, it is clear that I wasn’t too comfortable writing. Hopefully over time my writing will have improved. Or at least not gotten much worse. I read a decent amount of blogs. Okay, I don’t actually read them all always. I guess I would say that I have a bunch of blogs in my blog reader, and at times I read some of them. After reviewing my old posts, I started wondering how better writers go about writing in their blogs. What are the mechanics of writing a blog entry? I see writers that were professional journalists write several well written articles a day. And, yes, I understand that it was/is their job to write. But what are the mechanics. Do they just sit down and write? Do they make an outline and then write? Do they write and then rewrite? This has been a busy week. This whole summer has been busy. Not crazy and stressful like last summer. But busy. I kind of feel that the summer is a bit like a water slide. I jump on at the beginning of the summer and it is a rush to the end of the slide. I have loved each week this summer, but I am also looking forward to the fall. Susanna and I decided that, for the most part, we would not put the boys in summer camp the weeks they are here. Their last week of the summer here is the exception with Ben going to basketball camp and Will going to Project Oceanology. That has meant three weeks of family fun; although the first week was wedding week and not just family fun (but it was lots of fun). This past week has been no exception. The boys arrived Monday morning. It takes the boys a couple of hours to land after a transition. But in the afternoon I took the boys and Will’s friend sailing. Susanna worked that night. Tuesday was no less busy. I worked and Susanna hung out with the boys. We met for lunch and she took them to the aquarium for the afternoon. Wednesday was my furlough day. 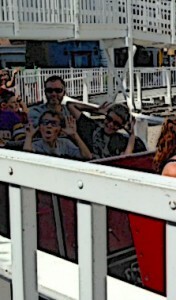 We had planned on going to Six Flags, but Ben was feeling sick. I took Will and his friend, Tyler, to the north lake and spent the afternoon watching the boys play in the water. Thursday I again worked while Susanna hung out with the boys. We met for lunch and she took the boys to a movie in the afternoon. Furlough Friday we went to Six Flags to make up for Wednesday. Yesterday the boys had friends over (Will had Tyler and Shane; Ben had Max). I tried to get some projects done in the workshop, but mostly wound up making swords and daggers out of wood for the boys. With five boys over it is a continuous line into the workshop. Each boy constantly wanting a better sword, or bow, or dagger made from wood. But I wouldn’t trade it for an empty project day. The weeks where the boys aren’t here are too quiet and I don’t get much more done around the house. Today we are finishing up the week with a quiet morning. The boys both wrote about their weeks on their blogs and are unwinding this morning. Later we will clean the house and maybe go sailing this afternoon. Tomorrow I head back to work for a full work week. Now I should go proofread my writing before posting to the blog. 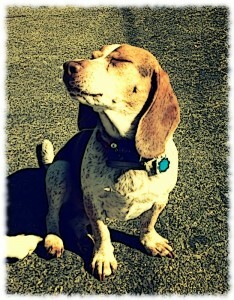 I took my next two furlough days this Wednesday and Friday. We had initially planned to go to Six Flags on Wednesday. However, in the morning, Ben wasn’t feeling up for a big trip out (he was fighting a cold). Instead we took an easy morning. In the afternoon, Will and I picked up his friend, Tyler, and headed to the base to go swimming at North Lake for a couple of hours. Ben stayed home with Susanna and rested. 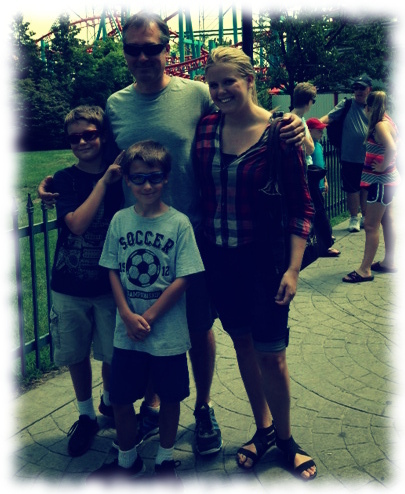 Yesterday we headed to Six Flags. It wasn’t as hot as it was earlier this summer, but it was warm enough to support going to the water park for a couple of hours. We had a good day at the park, and headed home in time to catch dinner on the drive home. Now I’m almost half-way done with the furlough. I think after next week, I switch over to taking furlough days each Friday until completed. There are rumors of the number of days being shortened to 6 or 8 total days. But of course those are just rumors.